Have you ever tested our literature recommendations feature? Have you noticed that the quality of our recommendations differ from being already decently good to being absolutely pointless? 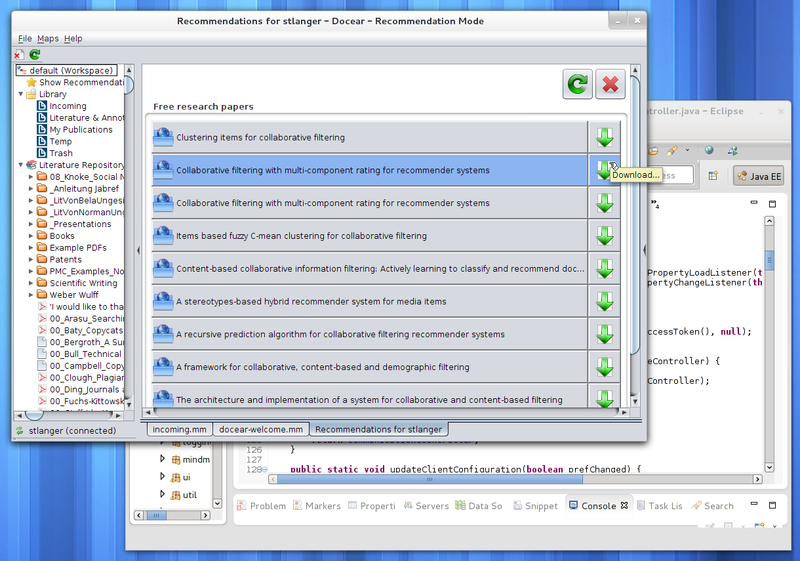 Our scientific field of work includes recommender systems based on mind maps and we are currently validating and comparing various approaches and their usefulness. The different algorithms and their parameters are currently chosen randomly, hence the changing quality. We will release the results of our work very soon and share the outcome with you. If you want to help us, or if you just want to get a glimpse about new and probably much better recommendations, please download this new experimental version of Docear and test it. If you can't find any critical bugs, we will release this version as a new beta version of Docear on Tuesday and implement the necessary changes to our web service. Thanks for your support, thanks for all your reports and suggestions, thanks for your patches and thanks for using Docear! Version: 1.0.33.2 ; Page loaded in: 0.04 seconds.